Our second best selling Oolong — is this great green oolong of Ti Kuan Yin and the addition of pieces of Strawberries and Lemon! Great Iced. Our Ti Kuan Yin (Tieguanyin) is originated from Anxi in the Fujian province in China and named after the Iron Goddess of Mercy . Ti Kuan Yin has a delicate flowery fragrance that is similar to orchids especially when harvested in the spring and the fall. The Ti Kuan Yin Oolong tea is considered a supreme premium tea selection in China and has a slightly red berry flavor and velvety mouthfeel. In this blend we have added pieces of Strawberries, Lemon and Lemongrass to give it a super fruity taste. Ingredients: Organic and Wildcrafted Tin Kuan Yin Oolong from China and Organic and Wildcrafted Strawberry Pieces, Lemongrass and Lemon Peel. Alternatively, try our Luscious Strawberry White Tea or Grandma’s Garden Green Tea. When talking about the many types of tea, Oolong is a fun tea falling in between Green and Black Tea depending on how much it is oxidized. The primary countries that export Oolong are China (mainstream) and Taiwan (high end) teas. We carry mostly Green Oolong from China in our blends because it pairs well with the fruits we add to the teas. We also carry some speciality Oolongs from Taiwan. The original origin of Oolong is from high elevation regions where the mountains are rocky with cooler temperatures. The leaf is left unfermented making it a green Oolong or it may be fully oxidized making it a Black Tea. Either way this tea leaves a fresh golden after taste in the mouth! Wonderful and unique flavor. The Oolong Tea is from China’s Hilltops near many streams that run along the mountain! It is plucked in the crisp air for superp taste and then is semi-oxidized after harvesting to give the great rich Oolong taste this tea is know for! Milk Oolong Tea is a light yellowish cup of tea with milky sweet aroma and smooth and sweet lingering taste. It is a very special hand processed tea from Taiwan produced from tea leaves at certain time, temperature, altitude, soil conditions to get the milky silky texture. Our Milk Oolong Tea is naturally processed and not scented. Try it ...it is amazing! This is the best combination of Oolong with Peach and Strawberry! Plus this is the House Tea for a great local company called HuHOT! So if you are in the area, try this place and have a tea...so yummy! This fantastic tasting Ti Kuan Yin Oolong with Peach is a great place to start if you are new to Oolong...so smooth and rich with the hint of Peach...yummy! Our best selling Oolong is this great green oolong of Ti Kuan Yin and the addition of pieces of Strawberries...give it a try! A light and mild Ti Kuan Yin Oolong Tea with Coconut Shreds added to make this our best selling Coconut blended tea...like a tropical drink!! Taiwanese Oolong Tea with deep notes of Raisin and Ripe Fruit and Autumn Leafy Note. Taiwanese Oolong (which means 'Beautiful', given by the Portuguese explorers of the island) with a Lingering flavor and smooth, refreshingly fruity astringency. This is a Fijian Green Oolong Tea from China with Powdered Ginseng and Licorice Root added to the tea leaves and folded many times. 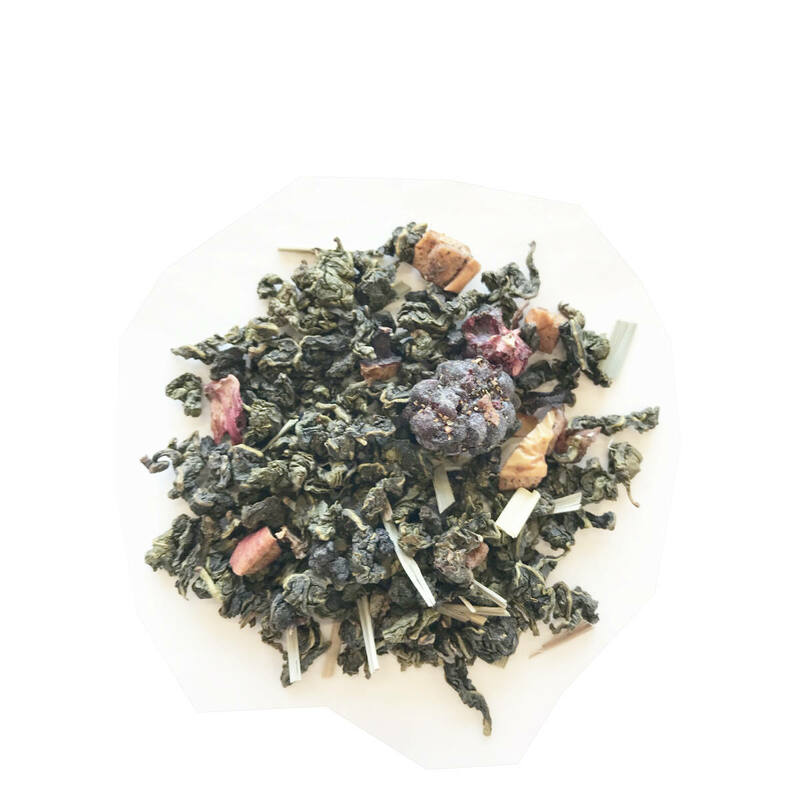 A great flavor to this earthy Oolong filled with soothing Licorice Root and energizing Ginseng. Great for a pick me up!